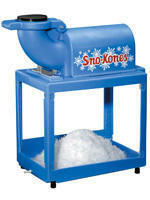 Make your party, fair, or fun day a real event with snow cones. There's no better way to cool off in the hot summer sun. This is a great addition for school fairs, church events, or even birthday parties. We have a variety of flavors to choose from and offer classic paper cone cups or you can upgrade to the baseball helmet cup. We also feature "Sour Attitude" which transforms any flavor into a real tongue tingling treat. comes with a rental pump free of charge with each syrup purchased) Serves 80.